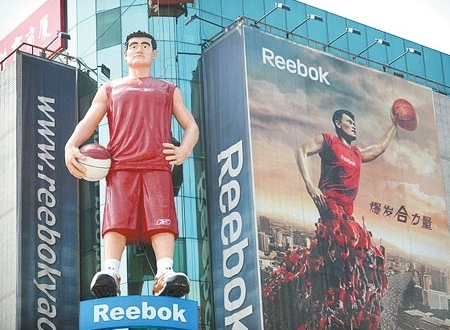 Raymond has posted in the forum some Olympic posters he has found that are on display in Beijing, including this 11 meter tall statue of Yao Ming that was hoisted yesterday in Wangfujing, the busiest shopping district in the city. Click here to see more of the Olympic posters Raymond found. This entry was posted on Friday, July 4th, 2008 at 10:12 am	and is filed under 2008 Beijing Olympics. You can follow any responses to this entry through the RSS 2.0 feed.